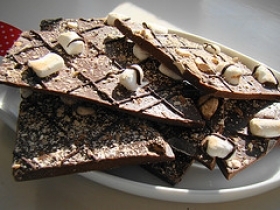 Have you made Brazil Nut Bark? 1. 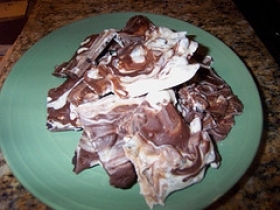 DIRECTIONS: Melt chocolate and butter over hot water. 2. Remove from heat, and stir in Brazil nuts and raisins. 3. Spread on cookie sheet lined with waxed paper. 4. Chill until firm. Break into pieces. Store in refrigerator. This recipe contains potential food allergens and will effect people with Butter, Fructose Malabsorption allergies.